Will it host/accept IAA connections also or only AUv3? It would be wild to be able to add Bias FX or ToneStack to the GUITAR channel in some instances. BTW, the new Test Flight version of MG2 seems to work properly with AUM now. Nice! working with AUM: nice to hear! we’ll support AUv3 plugins only. The idea is to save the plugin state within our patch. IAA does not support that. very good news, IOS has to evolve to a universal standard and audio units is the most promising and professional option without a doubt,what happened in desktop computers prove it. Beta 2.6 with AUv3 hosting sent to Apple. If nothing goes wrong it will be available via TestFlight tomorrow or the day after. Wow, I want! Looks great. TestFlight noticed me that there is a new version, but when I try to open nothing has been downloaded and the version it appears is 2.5.2 “adressed an issue with inter app audio” so its clear its not the latest one, right? How I can access the latest version? It should automatically find any AudioUnits when it start up and you should see them as Instruments or audio FX’s. MIDI Machine AU’s not supported yet. On iPhones they are almost full screen which should be fine whereas on iPad they take up the lower half of the screen, which might be too little space for some synths. Please let us know how it goes. There is a new IAP for unlocking this hosting. It should not charge your Apple ID when using TestFlight. We already submitted the next beta (2.6.2) with mostly user interface adjustments. 2.6.1 seems too have broken virtual midi. In the interface selecting the virtual midi out is not working right. AUv3 hosting is great but the options are somewhat limited. MG2 appearing in AUM added some flexibility in routing. But AUv3 doesn’t really achieve much more than I could do with AUM and MG2 alone. MG2 doesn’t appear as an IAA option in Audiobus 3. I guess it will be cool for people who use MG2 as a standalone app. I don’t really understand why MG2 couldn’t host IAA slots also. Other apps can. IAA slots dont save states: for MG as an host, we want the plugins to be saved in the patch. Those patches are recallable per midi programchange: AUv3 plugins have storable states so will be saved within the MG patches. The AUv3 hosting is meant to simplify guitar plus synth setup, and make them recallable per footcontroller. AB supports IAA instruments, not IAA effects. We currently only have IAA effect, which seems logic for the usage pattern: MG wants to receive the audio from the host. We’ll look at the virtual midi problem. It seems that MG2 as an IAA effect in AUM sometimes ‘dies’. The icon remains active but the sound dies. I’m not sure if this is because of the prompt to make an IAP (which is pretty annoying). The prompt in standalone definitely stalls audio but it behave s slightly differently when used as an IAA effect in AUM. I have to shut it down and reinstate it to make it work again. Ok, this is not related to AU hosting, but we’ll have a look at this. Thanks for reporting. Version 2.6.4 is now up on Testflight and it has a setting to adjust the aspect ratio of the hosted plugin window size. Its also possible to set the window “Big” which will overlay the rest of the MG user interface on iPads. From our testing it seems that the AudioUnit hosting is now good to go. The ui of Synthmaster it’s still clipped (some parameters dont show) and much worse the ui of Zeeon is seriously broken. Tried in garage band and they show mostly okey. Is there no way to implement a scrolling to access all the parameters? Synthmaster and Zeeon draws nicely on various iPads and iPhones here, but I assume yours in an iPhone XR which we will try to get to reproduce this. Unfortunately we have no control of how a 3rd party synth draws itself. We only create a window and then the synth must draw itself in that window. All we can control is the size of the window. I believe that the rule is that the synth should adapt to any kind of window size, but not all synths do that. Did you try to change the aspect ratio parameters in the plugins section? 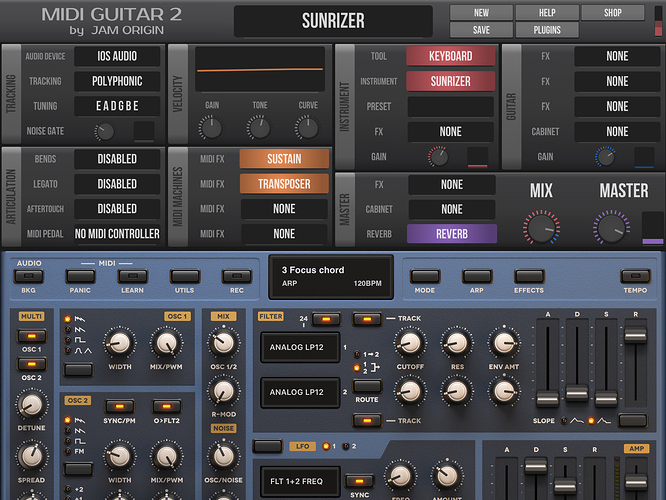 I am testing the latest TestFlight release and noticed that in the FX selection for the guitar the Deep Expressor no longer appears. So unless you load a patch that already uses it you cannot add it to an FX slot. Prior to being able to insert AU instruments I had been using external MIDI to drive synths in AUM, which I still prefer in many ways as I can access the MIDI controls for the AU from AUMs control panel. Would it be possible to expose an AU’s MIDI controls from MIDI Guitar when its used as an IAA in AUM? It would also be useful to expose other MIDI Guitar controls for linking to MIDI controllers, like the desktop version does. A couple of other questions: what does the DIRECT selection in an FX slot do that is different to NONE? I noticed that tapping on the MIX knob label changes it to SPLIT - what does this mean?